It’s normal to notice irritation or swelling after getting inked. But tattoo allergies go beyond simple irritation — skin can swell, itch, and ooze with pus. Most allergic reactions are tied to certain inks. This hypersensitivity often presents as contact dermatitis or photosensitivity. You can usually treat mild cases at home. But if your symptoms persist — or are more severe from the start — you’ll need to see a doctor or other healthcare professional for diagnosis and treatment. Read on to find out what symptoms to watch for, how to tell the difference between an allergy and an infection, your options for treatment, and more. Allergy symptoms vary by severity. Some are simply skin-deep and resolve in a few days. Seek emergency medical help if you develop swelling around your eyes or have difficulty breathing. What’s the difference between an allergy and an infection? Although the symptoms are often similar, there are a few key differences that may help you distinguish between the two. These symptoms only affect the skin near your tattoo. Think localized itching, burning, swelling, and redness. You shouldn’t have any allover symptoms. If the ink is to blame, your symptoms will only appear around the offending pigment. Red ink is the most common allergen. Often, your symptoms will only last for a few days. In some cases, symptoms may last for a few weeks before disappearing entirely. Infection can also cause redness, irritation, and itching, but these symptoms typically extend beyond the tattooed area. Surface symptoms may be present in addition to those that affect your entire body, such as fever or chills. Infection symptoms also tend to last much longer — anywhere from a few days to a week or more. Are there different types of allergic reactions? Not all tattoo allergies are the same. Your reaction could result from an immune system response, a skin condition, or overexposure to light or other allergens. You don’t have to be allergic to the ink or other materials to have an allergic reaction. Sometimes, the process itself can irritate your skin. 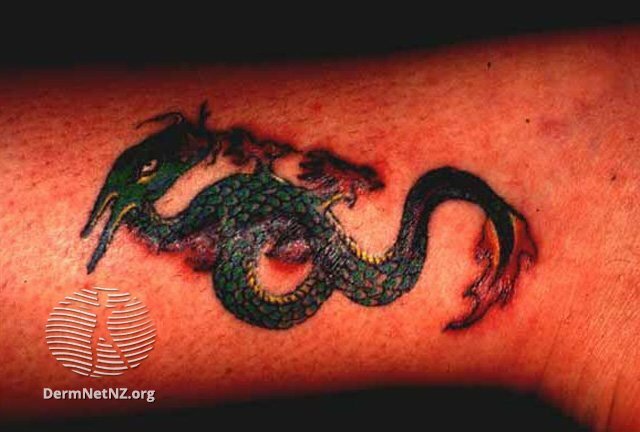 Many people experience mild redness, swelling, and itching after getting a tattoo. These symptoms typically clear up within a couple of weeks. The ingredients in certain inks can react with sunlight or other bright lights. This can cause swelling, redness, and itchy bumps. Yellow, black, red, and blue inks are the most common offenders. If you’re allergic to the ink itself, you may develop symptoms of contact dermatitis. This includes swelling, itching, and flaking. Contact dermatitis is often associated with red inks. Overall, they’re most commonly tied to red inks. A lichenoid reaction happens when small, discolored bumps appear around where the ink was injected. It’s most common with red inks. These bumps usually aren’t irritating or itchy, but they can appear beyond the area where ink was injected. If your symptoms don’t immediately appear after getting your tattoo, you may be experiencing a pseudolymphomatous reaction. It’s usually in response to red inks. In these cases, rash, red skin growths, or other irritation may not appear for afterward. What causes an allergic reaction to a tattoo? Tattoo allergies are often caused by ingredients in tattoo inks, such as pigments, dyes, or metallic substances. Some inks now contain dyes made from the same components used in car paint and commercial printing. These can all stimulate an immune response as your body attempts to remove the ink as if it’s a foreign invader. Tattoo ink isn’t regulated by the U. S. Food and Drug Administration (FDA), so you may not always know exactly what’s in your ink. But the FDA does compile reports of people’s negative responses to certain ingredients. It’s best to ask your tattoo artist to look at the inks they use to look for any ingredients that may cause a reaction or may be documented as potentially harmful. Notice any swelling, oozing, or other signs of irritation? Stop by your tattoo shop to let your artist know what you’re experiencing. You should also ask your artist about the inks they used and the processes they followed to inject the ink. These details will help a doctor or healthcare professional determine what exactly caused the reaction and how to best treat it. Once you have this information, see a doctor right away. Let them know that you recently got a tattoo and tell them about your symptoms. Make sure you relay any information that you got from your tattoo artist. If your symptoms are mild, you may be able to use over-the-counter (OTC) medications to find relief. OTC antihistamines like diphenhydramine (Benadryl) may help reduce overall symptoms. Topical ointments, such as hydrocortisone or triamcinolone cream (Cinolar), may help soothe local inflammation and other irritation. If OTC methods aren’t working, your healthcare provider may be able to prescribe a stronger antihistamine or other medication to help ease your symptoms. Do I need to have it removed? Removal usually isn’t necessary. If you take care of the affected area, your symptoms will likely fade after a few days without leaving any visible marks or scars behind. In severe cases, untreated allergic reactions and infections can disrupt the ink and disfigure the tattoo. Identifying the reason for your allergic reaction can help you decide what to do next. Your artist may be able to touch up or add on to the tattoo to hide the blemishes. If your skin is unable to endure additional ink and you don’t want to leave the art as is, removal may be an option. See a doctor or healthcare provider to discuss your options. The best way to prepare is to learn more about your reaction to other allergens and to research your potential tattoo artist. Find out if you have any common allergies. If you can, make an appointment with an allergist and tell them about your previous allergic reactions. They may be able to test for related allergens and help you identify other ingredients or triggers to avoid. Find out if you have any underlying skin conditions. Some conditions, such as psoriasis and eczema, may make you more prone to adverse reactions. Don’t get a tattoo if you’re sick or your immune system is weakened. A weak immune system can make you more susceptible to allergic reactions. Does the shop have a license? Licensed tattoo shops are regularly inspected for health and safety violations. Does the shop have a good reputation? Check out online reviews or ask friends who have tattoos. Visit a few shops before you decide on one. Does the shop use ink with safe ingredients? Ask your tattoo artist about the inks they use. Make sure you tell them about any previous allergic reaction. Does the artist observe safe practices? Your artist should put on a new pair of gloves before setting up new, sterilized needles to use during your appointment.